If you grew up or have lived in North America for several decades, you probably remember the Monarch butterfly with its bold orange background, the black outline and stripes, and the white speckles. Sadly, the Monarch population is dwindling drastically due to loss of habitat and this year, their situation appears to be even more dire. In the picture of the male above, taken by my friend Vineeta, you see the black spots in the center of his hindwing, which are scent pouches that release pheromones to attract the females. Vineeta also took this photo below of the female sipping nectar from her asters. She’s a newborn Monarch ready for her flight north as part of the annual migration – one of nature’s true wonders. Vineeta and many others are trying to bring back the Monarchs by creating Monarch Waystations (restoring their habitat) and caterpillar nurseries. In this post, we’ll tell you how you can support this effort. 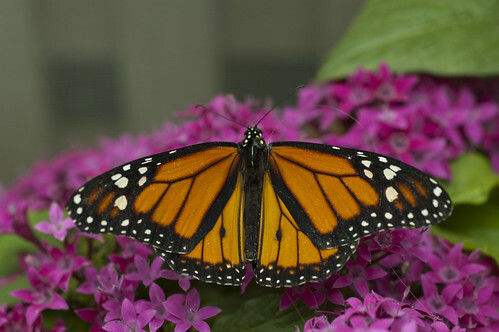 Vineeta has been tracking the Monarchs since 2009, thanks to a neighbor who got her interested in planting Swamp Milkweed (Asclepias incarnata) to attract the Monarchs and give them a habitat for laying eggs. 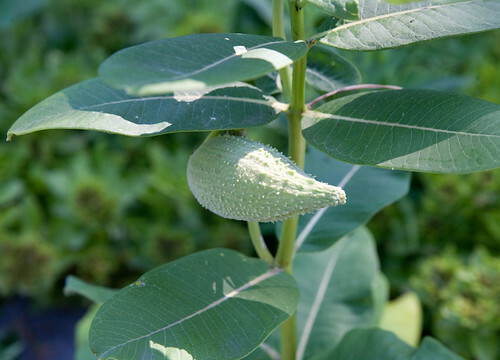 Milkweed is the only plant they lay their eggs on. 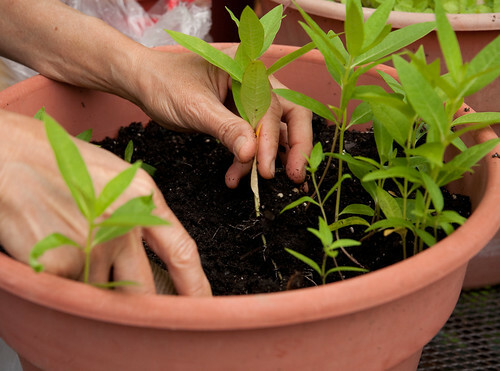 You can plant several varieties of Milkweed. Here’s one of the Common Milkweed (Asclepias syriaca) plants with pods that grow in clumps and have fine silky seeds inside. Vineeta’s neighbor gave her and other neighbors the Milkweed plants in the spring of 2009 and she was delighted to find eggs on them in the late summer. 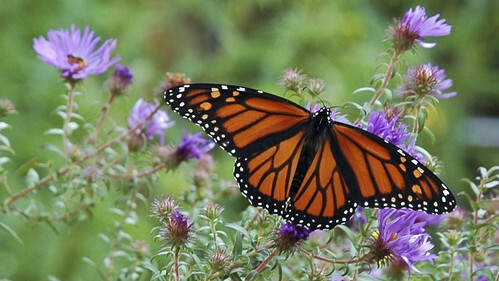 She’s now taken up the cause of “bringing back the Monarchs” in earnest, working with her friend Mona Miller, a naturalist and butterfly expert, who leads a Monarch Waystation project through the Loudon Wildlife Conservancy, and keeping tabs on the official Monarch Watch organization. 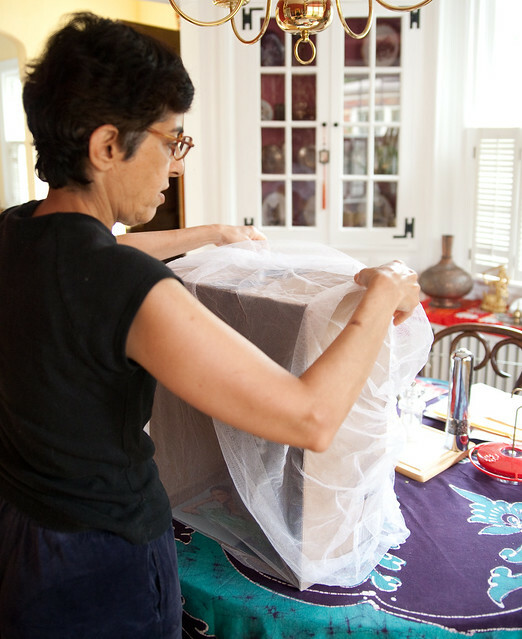 Mona and Vineeta grow starts in their gardens to give away. 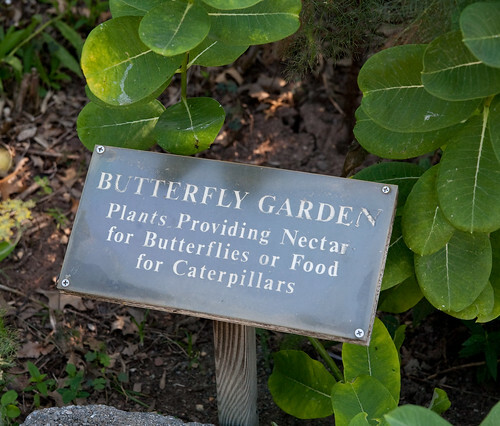 When you plant a butterfly garden and you include Swamp Milkweed, as well as plants that provide nectar, you create Monarch Waystations to support the spring and summer Monarch breeding areas. 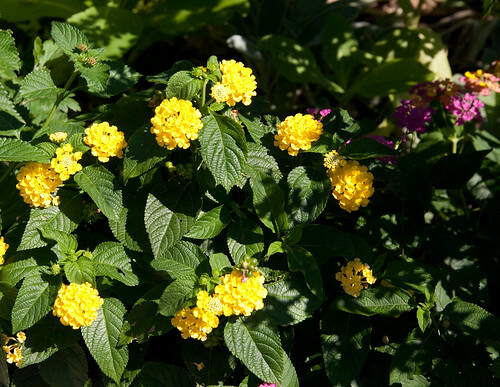 You give the butterflies host plants for their larvae and fuel for support the adults’ journey. Vineeta and I toured her own garden and the Simpson butterfly garden next to the YMCA on Monroe Avenue to identify plants that provide nectar. The Simpson garden is great because it identifies each plant by number and offers brochures that you can consult on your tour. There are so many options to plant, in all colors of the rainbow. 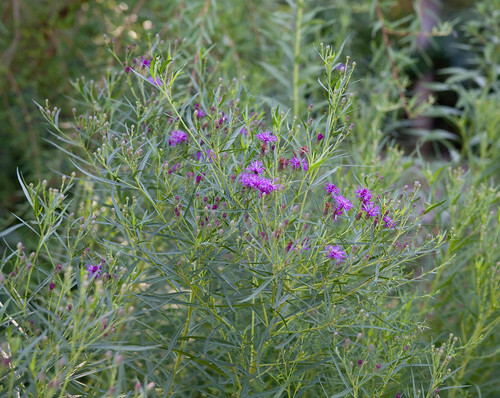 On our walk, we saw many of the shrubs, annuals, perennials on this thorough list from Monarch Watch. Apart from attracting the adult caterpillars and giving the Monarchs a host plant, Vineeta also protects the caterpillars from predators like the Catbird. 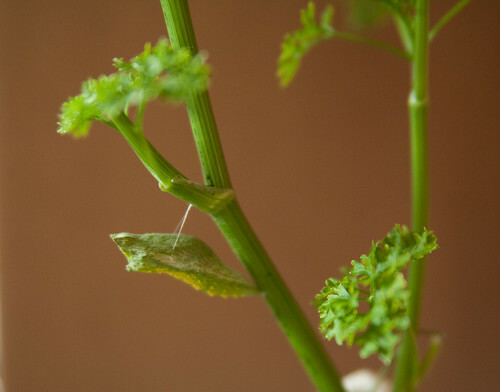 Vineeta noticed a Black Swallowtail caterpillar on her fennel in May. To protect it from wasps, she brought it inside with the cutting from the host plant. 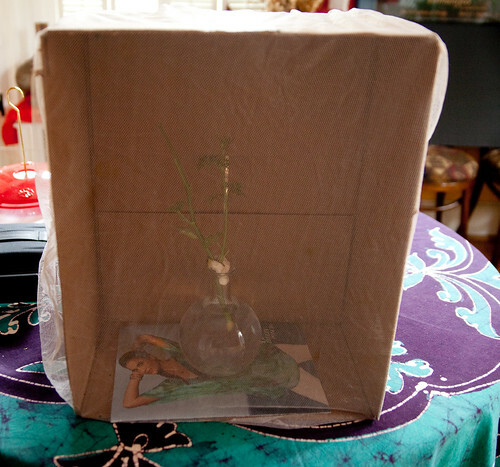 She placed the cutting in a vase inside a shallow cardboard box covered with netting. And that’s where the caterpillar turned into a pupa (chrysalis). 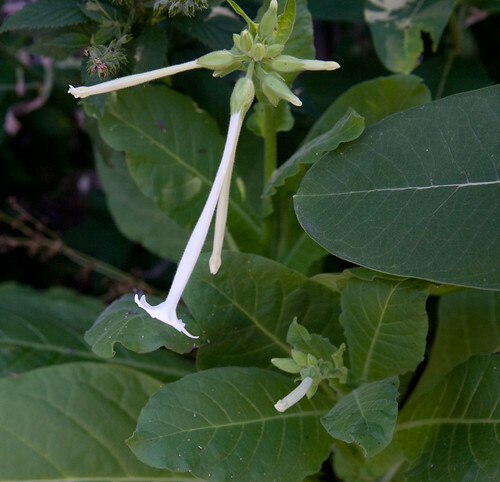 Notice the delicate filaments that it uses to hang from the plant. 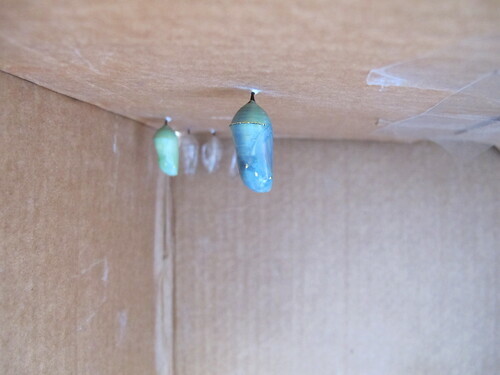 It took about three weeks for the Black Swallowtail butterfly to emerge after she first brought the caterpillar indoors. 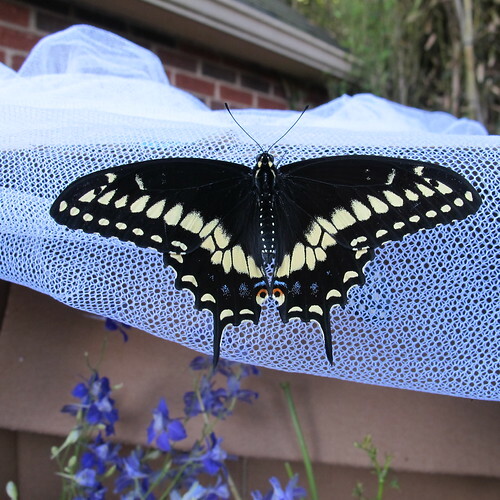 When the butterfly was ready for release, she opened the nursery outside and bade the gorgeous Swallowtail farewell. Last year, Vineeta successfully raised 8 Monarchs in her nursery too. She gently urged the newborn butterflies to fly away one by one, praying they’d also fare well. 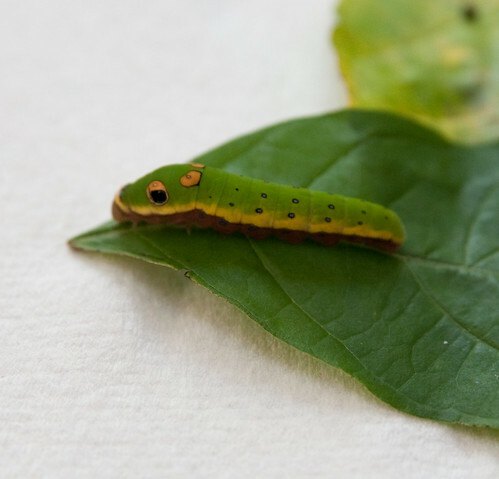 Last weekend, Vineeta’s friend, Taryn Salinas, who also has a large butterfly garden, brought over a Spicebush Swallowtail caterpillar to show her. Vineeta’s friend Mona is going to give Vineeta some Monarch caterpillars to raise as well this weekend. Mona breeds, raises, and hatches Monarchs to try to help boost the population. If you want to raise caterpillars at home, the Monarch Watch site offers practical tips. Watch the IMAX film, Flight of the Butterflies, which describes the discovery of their remarkable migration. Read more about the drastic decline of the Monarch and possible reasons. Buy and plant Milkweed seeds this fall by purchasing a kit from Monarch Watch. Create seed bombs with milkweed seeds and do some guerilla gardening around town. Add pins to our new collaborative Google map on Del Ray/Rosemont/Beverly Hills milkweed locations. Register your Monarch Waystation and then buy a Monarch Waystation sign as a donation to Monarch Watch. Keep a lookout for Monarch caterpillars and protect them from birds by creating caterpillar nurseries. 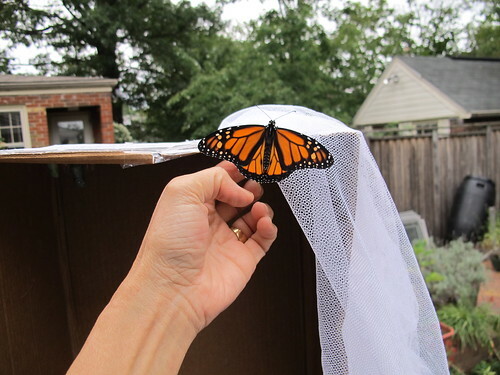 The Monarch Watch site offers practical tips for rearing the Monarchs. Monarchs born here fly north. The northward migration takes three generations. The southward migration is non-stop, Canada to Mexico. Thanks – this is great stuff! I planted Butterfly Milkweed this year and have plenty of volunteers. Would love to swap for Swamp Milkweed, if anyone is interested. I’m going to put you in touch with someone who can swap with you, Ben. Will email you. I just spotted the first Monarch of the season finally today. She was a female and her wings were quite ragged, so I’m guessing she flew quite a distance to get here. I’m hoping that others will follow soon.